Get fit like 50 Cent: The phenomenally fit superstar rapper reveals his strategic six-week workout plan for achieving a ripped body--and developing the mental toughness to stay in shape for a lifetime. Survival is a recurring theme of 50 Cent's lyrics, and his life. That's why, with obesity rates soaring and fitness levels declining, he wants to give everyone an all-access pass to his premium plan for lifelong fitness. 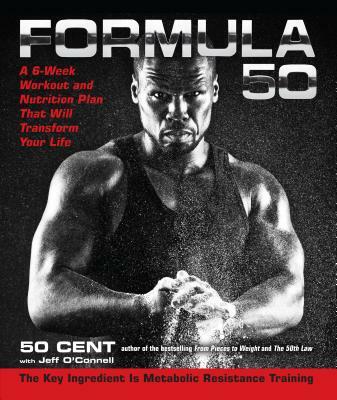 In "Formula 50," the mega-successful entertainer and entrepreneur unleashes the power of metabolic resistance training (MRT), the key ingredient that has helped him achieve the famously buff physique that makes his music videos sizzle. Through MRT, 50 Cent's fitness plan breaks down the barriers between traditional weight training and cardio workouts, accelerating fat loss while building muscle and improving overall fitness. Designed for a six-week rollout for total mind-body transformation, the "Formula 50" regimen builds willpower while it builds physical power. In addition to motivation, nutrition is another key element; readers will discover the unique dietary combinations that fuel 50 Cent's workouts. Coauthored with Jeff O'Connell, health journalist and editor-in-chief at Bodybuilding.com (the world's largest fitness website), the book delivers a payoff that goes beyond six-pack abs and flab-free pecs: This is a fitness plan that boosts energy, endurance, flexibility, and mobility. The result is a body you've always dreamed of--and the mindset to attain the rest of your dreams.